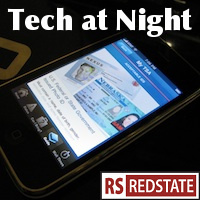 Sorry if you missed Tech at Night on Friday. I was under the weather. But I’m back, and with so much to review. How about legislation, good and bad? Well, mostly bad. Senate Democrats continue to push for senseless regulation of 4G Internet speeds, hindering vital new technology to increase high-speed Internet competition in America. Worse, Democrat Anna Eshoo is piling on in the House. Mary Bono Mack continues her push on privacy and security even though I don’t really see a government role in that, at least when it comes to private sector data. High profile cases do not good models make. Joe Barton wants to harass Amazon now, once again proving we did the right thing in not letting him head up Energy and Commerce. Seriously: If you’re allying with a Massachusetts Democrat, reconsider. When government comes preaching fairness, watch out: the push for a nationally-enforced Internet sales tax continues, which of course is just the first step to a joint state-national sales tax akin to the Canadian Harmonized Sales Tax. It’ll start at just one percent, I’m telling you. “One penny, for the children,” or “for seniors,” or even “for the Global War on Terror.” And then it will grow. We’re deeply in debt and running a massive deficit, but it’s time for a new program on “distracted driving”! OK, one piece of good news: Kay Bailey Hutchison is pressing the issue in the budget supercommittee of all places. encouraging voluntary incentive auctions of spectrum is great news no matter what the context, as we need all we can get. Giving the D block, previously proven to be unwanted at auction, over to civil defense is also good news, I believe. We learned that on 9/11. Look, I’d be all for auctioning it… if we hadn’t already tried and failed. In other news: one reason LightSquared is getting flak from FAA, is that the firm’s spectrum deployment will “result in an additional 30 tons of CO2”, per an FAA presentation on July 26, 2011. Yes, we’re supposed to hate LightSquared because of glowball warming. Whee. How about some FCC? Kelly Cobb makes the case for rolling back Net Neutrality, something that needs doing. That’s not the only bad thing the FCC is up to, though. The pigs continue to run to the trough of so-called Universal Service Fund reform, or Julius Genachowski’s grab bag of subsidies and bailouts. Oh yes, and they also join with Eric Holder to be a united Obama Administration front against AT&T and T-Mobile, as a legal bailout of Sprint Nextel. Mergers for me, but not for thee. AT&T isn’t giving up, though. PATENT WARS: Apple fends of HTC – Google’s proxy – for now, Apple beats Samsung in Australia, Samsung challenges Apple in Japan, but in the end, Apple may continue to work with Samsung to make iPhones. Try, just try to tell me we needed more patent lawyering, not less, in this country.